Tom Brady and Jared Goff are each looking to make history this Sunday. Welcome back to the reality of Super Bowl week without the Philadelphia Eagles. Wouldn’t the NFL love the Eagles to be in Atlanta this week and have Philadelphia fans taking over the town? Instead, the NFL gets a strange mashup of legacy versus new guys. 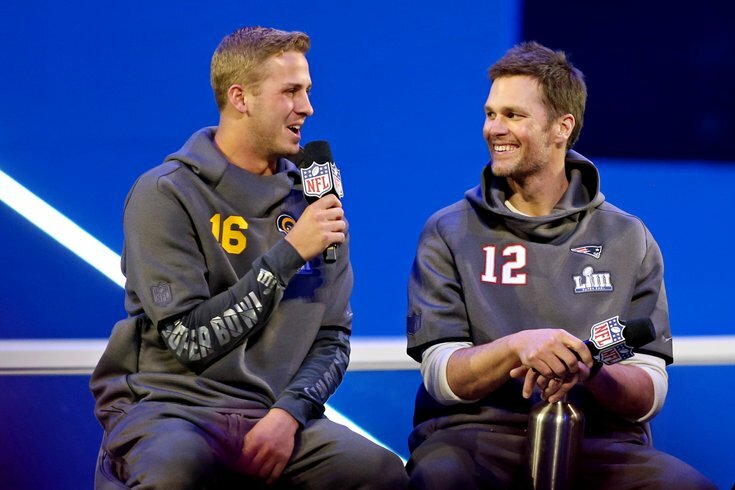 The NFL will hope the storyline of Tom Brady’s attempt to win a sixth Super Bowl against young gun Jared Goff, and whether coaching legend Bill Belichick will school the latest, hotshot young coach in the NFL, Sean McVay. As always, the Patriots will arrive as the Evil Empire, although the chants of cheaters sound increasingly hollow each time the team reaches the final game. The reality of the matter is that the Patriots are in this game so often it gets boring in terms of fan interest — outside of New England and the town of its opponent, of course. In this case, even that is a stretch because the Rams arrive as team with no real base of fans. It seemed that every so-called home game played in Los Angeles was actually a homecoming for the visiting team, which always had nearly as much support as the new team in town named the Rams. It would have been so much more enticing to see the Eagles back in the game, or even what would have been a clash of titans between Brady and Drew Brees of the New Orleans Saints. Oh yes, there will actually three teams on the field Sunday; the Patriots, the Rams — and the officials. Once again, the NFL’s officials were exposed throughout this season as unable to handle their duties at the biggest of moments, and, as usual, it will be up to the players in the Super Bowl to put on a show that overshadows the mistakes made by the NFL from September through the end of the season. The Philadelphia Phillies find themselves in a rare spot where stupid equals smart. In this case “stupid” refers to the stupid money that club owner John Middleton referenced after the season when asked about the team’s interest in pending free agents. At this point, there still appears to be roadblock at the head of the free agent river as steep price tags on infielder Manny Machado and outfielder Bryce Harper have slowed the slog of free agent signings. Despite howls from player agents, this is not likely a case of collusion on the part of Major League Baseball’s owners, but rather a step back in terms of how to build a team. It seems in all sports that ownership is more willing to shy away from huge contracts in terms of swinging for the fences, and replacing that philosophy with younger, cheaper players that can be kept under contract for several seasons. It might make sense for most teams, but the Phillies are in the largest market in the country with just one team, they have a pretty good batch of younger players such as Rhys Hoskins and pitcher Aaron Nola, and a pile of cash under the luxury tax threshhold. In other words, the Phillies don’t have to be the snake in the grass here to snag a top free agent. The Phillies and Middleton can simply wield their wallet and take away the prize or prizes. The Phillies are rich in money from a local TV contract, and they have a fanbase that has proven it will get lured too Citizens Bank Park if the product is worthy. This whole free agent process has already taken a pretty long course, and the Phillies have the money and the need to make it end — no need to wheel out some argument about saving space for Mike Trout at some later date. Some later date is not guaranteed, and it’s pretty dopey to think that Trout is simply going to come back to Philadelphia because he was born in South Jersey and he would like to go hunting with Eagles quarterback Carson Wentz. The only hunting now should be the Goodwill hunting the team should be doing in trying to snare both Harper AND Machado. Finally, the Flyers have their goalie-of-the-future in Carter Hart, and it's a great relief to find out the club has no plans to send him back to the AHL affiliate for more seasoning. General Manager Chick Fletcher is now moving along with a plan to speed up the teams rebuild, and having Hart as a mainstay the remainder of this season is the first step. The hope here is that Fletcher will look at the remainder of this season as part of next season. In fact, the Flyers should just look at what is left of this campaign as the 2019 season and just throw out the part about being the 2018-19 season. Barring a rebound of historic proportions, the team suffered too much damage from October through January to save this season. However, Fletcher now has a whole lot of runway to make sure the team has a smooth take off next season. Fletcher is going to have to make some of the addition-by-subtraction decisions that former general manager Ron Hextall did not want to make when Hextall smartly decided to stock the team with draft choices and highly regarded prospects – such as Hart. It is now up to Fletcher to decide which of those prospects stay in the organization and which can be swapped for players who can help right away. Very quickly, Fletcher is likely going to have to make a deal to trade Wayne Simmonds at the deadline, and also offer some other commodities in terms of veterans such as Jake Voracek, Radko Gudas and even Shayne Gostisbehere to get a team with better on-ice chemistry. Fletcher’s hands will be tied with some big numbers on veteran contracts, but he does have enough in the prospect cupboard to add in trade talks. He will also have the remainder of this season to see if Ivan Provorov is worthy of top-level money, and if Nolan Patrick is the next generation pillar that was expected. There is a whole lot of important stuff to get done, and the first thing to realize is that Gritty might be nice front-page stuff and a marketing home run in terms of media attention, but Gritty ain’t gonna sell tickets.